Now - I know nothing about Monteverdi. But this came with jhar26's strong recommendation, so I watched a few youtubes, and took the plunge. It arrived today and I've watched the first two Acts. It's a winner from the start - the unusual camera perspective showing the conductor striding down the aisle; the musicians in the boxes as well as the pit. The music so exciting... and then - the sets. What a stroke of genius this was - to take the landscapes of Claude Lorrain and use them to provide the backdrop; so right from the start there's an visual atmosphere of late-afternoon wistfulness in a classical landscape setting, and once the characters emerge, it's like a Claude painting come to life. The visuals get even better when the dancing begins. Whoever designed the costumes (and for Pete's sake, take a good look at their colours, which harmonise with the kind of mastery I'd associated with a colourist like Paulo Veronese) was brilliant. When the dancing starts, the folds of the costumes are so gracefully dynamic that it's the movement of the costumes, not the dancers, that ravish the eye. Here's a Youtube snippet of the intro. Last edited by jhar26; Dec-25-2010 at 14:22. 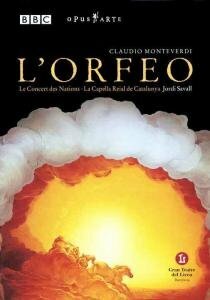 And what a work of genius from Monteverdi. There had only been a few operas before this one, and they were completely made up of recitative only. And here we have these Monteverdi guy creating a masterpiece of the genre out of nowhere - amazing achievement. BTW - that intro with Savall walking in is a great idea since he looks a lot like Monteverdi in my opinion. It's as though Monteverdi himself is entering to conduct his own work. I think what surprises me most - naively, I admit - is how much it's a work of musical and dynamic contrasts, suddenly revealed. One moment everything is quiet, uneventful - one might say, veering towards the monotonous - when suddenly without warning the music leaps up about 20 gears, and in come a bunch of dancers cavorting about with the energy of spring lambs. As if he knew we might just be starting to nod off, so he'd jolly well put a stop to that! I've now seen/listened to the whole thing. My response after just this single experience of it is mixed. I accept all the stuff about the brilliance of the groundbreaking concept, etc; and I've already commented on some of the most striking aspects of its first impact on me. All those things being said, I found myself wondering about the pacing of it, and the musical dominance of Orpheus as a character. After the variety of both visual and musical impacts in the first two acts, it seemed to get bogged down in places later on. Orpheus's conversation with Charon is an example - where the singing became a kind of endless drone that raised thoughts such as 'For Pete's sake, Orphie - just kick him into the water, grab the boat and be done with it'. This may of course improve with more exposure to it; it may just be the result of unfamiliarity. So at the moment I have this feeling that it's one of those works which I shall always want to return to, but which I shall probably wish I could edit a bit. I don't think I'd want this on CD, for instance; or, if I did, it would be so I could edit it to compile a set of highlights. I know, I know. Sacrilege. But this isn't my last word on the subject; I'm well aware things can change. Well, 'L'Orfeo' is almost 150 years earlier than Rameau of course so it's a much earlier link in the evolutionary chain of opera. In fact, it's the first proper opera of any sort. And as you know French baroque is quite different from Italian or German baroque also. I agree that it can get a bit monotonous in the second half, but this is a five act opera. It's not supposed to be listened to in one go really. Maybe a break or two between acts to go have a smoke in the garden (or whatever) might do the trick. Still, good to know that for the most part you enjoy it, and it's considering it's historical importance also a good opera to have in ones collection I think. Oh yes - I don't have the slightest regret about buying it. The pros far outweigh the (not particularly weighty) cons. I am dragging a month behind you guys on this, but I have just watched the first two acts, having rented it from Netflix, and I'm finding it exhilarating. This is only my third opera to experience - or maybe the 6th. I counted the Ring cycle as one very long opera. This is the first one that actually seems to connect me with the past. I think that's what I'm looking for, not modern day costumes and weird interpretations - at least not yet. It is my understanding that Monteverdi and friends were trying to remake something like the original Greek dramas that they felt were really sung, and that this explains some of the slow pacing in this early experiment in the genre. I rather like the slower pace. I only have to glance at the libretto translation once in a while to catch the drift of what is happening and be free to enjoy the magnificent music, a luxury I did not have with the Ring, or with Fidelio. I was already well hooked on Monteverdi from the 1610 Vespers so the music alone is enough to carry me. But those dancing nymphs - ! I want to fall into some idyllic or dionysian dreamworld. And here I thought Monteverdi was all about the sacred. Yes, it does that wonderfully well, I think. I'm still very much feeling my way, like you, into this area. I think the Claude Lorrain backdrops are a stroke of genius: they alone create an expectation of Arcadia before even a nymph sets foots on stage. But those dancing nymphs - ! I want to fall into some idyllic or dionysian dreamworld. And here I thought Monteverdi was all about the sacred. Yes yes - and the way the costumes move as they dance, as if the drapery itself can hear the music - exquisite. I'm glad you like L'Orfeo, Weston. Monteverdi is a bit, well, not underrated but maybe not given as much attention as should be because early baroque is not the most popular era in musical history. He's nevertheless one of the giants though. I had seen the trailer on youtube but didn't know if I'd like the opera as a whole. 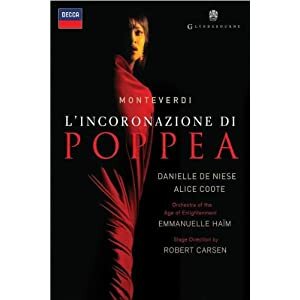 However lately I've been listening to a radio recording of Poppea from Teatro Real in Madrid (with Danielle De Niese as Poppea, Philippe Jaroussky as Nerone and Max Emanuel Cencic as Ottone) and I love it. That production will probably be on DVD too but not for a while. Anyway it was a very stressful process. I had planned to buy it from amazon.co.uk, had even saved it in my favourites, but now it said it was "currently unavailable". Then I went to amazon.com and almost bought it but discovered it was region 1 and that it might not play even on region free players So I ended up buying it on amazon.de through a verified seller. P&P cost 13€ but it's worth it. I'm very excited to see Richard Croft as Nerone, I have never heard of a tenor cast in that role. I like the music and how it interplays with the words quite a bit. I need to get through the whole opera though... over three hours of it. Haha. The special feature was neat! You get a frog in your throat, you sound hoarse. That's one of the things I love most about Monteverdi. It feels very modern in that sense. I have yet gotten through to the end of the first act, but I will make an effort to do so this afternoon. I do like it quite a bit, though. I especially like the leitmotiv-esque treatment with the whole "farewell" bit, it's really quite amazing. And the prologue is rather funny in a strange way, before it becomes all prophetic-like. At that point it's too Shakespearean and I don't care much for that. I do like it though. 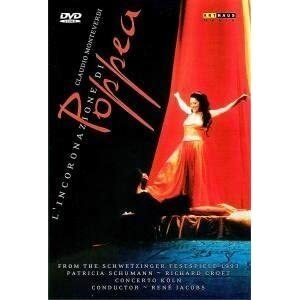 Poll - how many complete operas do you own? All times are GMT +1. The current date and time is Apr-24-2019 22:50.